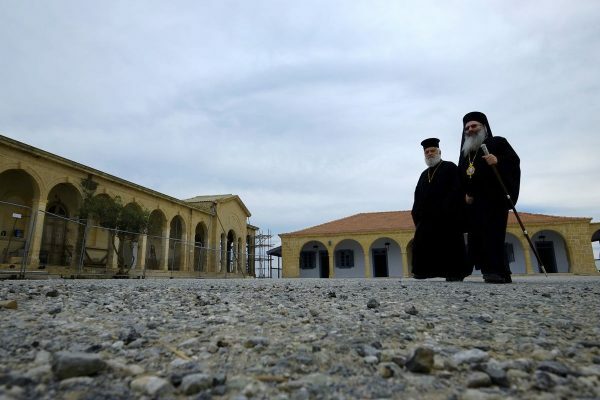 NICOSIA, Cyprus — Work carried out jointly by Greek and Turkish Cypriots to restore an Orthodox Christian monastery was hailed Monday as a symbolic milestone for unity and peace on the ethnically divided eastern Mediterranean island. Situated on the northeastern tip of the Karpas peninsula in Cyprus’ breakaway Turkish Cypriot north, the monastery is dedicated to one of Jesus’ first disciples, St. Andrew, and has long been revered by both Orthodox Christian Greek Cypriots and Muslim Turkish Cypriots. The monastery was built on the spot where it’s said St. Andrew’s ship dropped anchor until winds could pick up. A fresh-water spring from where water still flows is said to have miraculously helped restore the sight of the captain’s blind son. In gratitude, the captain built a small church atop the spring. Two years of work to restore the monastery’s crumbling church wrapped up Monday at a cost of 2.23 million euros ($2.47 million). Tiziana Zennaro with the United Nations Development Program that is overseeing the work said a second, year-long restoration phase of adjacent buildings and a medieval chapel will begin early next year. A 1974 Turkish invasion that followed a coup aiming at union with Greece left the island divided. A key phase of U.N.-backed reunification talks is now underway in Mont Pelerin, Switzerland. Hundreds of churches, religious sites and monuments in the north were left to ruin following the island’s split — “sacrificed” to politics, said Ali Tuncay, a Turkish Cypriot member of a committee tasked with restoration work. Tuncay said while monuments in nearby war-torn Syria are being destroyed as an attack on a people’s identity, work being done in Cyprus illustrates that a common cultural heritage can unite people of different faiths.